Last night I went to a magazine release party. Suite Tea magazine was celebrating the release of their August issue and my BF and I thought it would be an amazing opportunity to network others in the industry. My BF also had previously worked with the editor in the past. The magazine is a highly creative photography, fashion publication and the makeup looks on the cover are right up my alley. This cover definitely shows off my favorite color - magenta! **Picture credit to Urban Suite Entertainment and Suite Tea Magazine. 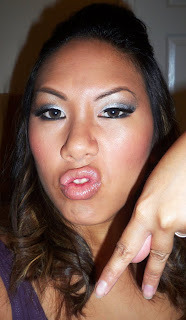 I wanted to make sure my face was in order, so I sent a message out on twitter asking for makeup look ideas. One person suggested silver and glitter. I really liked that since my dress was black with a bit of purple, and I thought silver would coordinate nicely. This also gave me the opportunity to use some of my new Graftobian products. 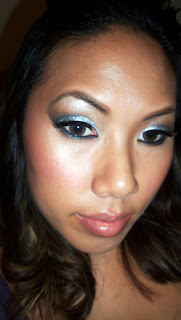 After applying my primer, I used my Graftobian Metallic Powder in Silver all over my eyelid. This product is like a pigment but better. You don't even need to apply it wet for it to be super vibrant. Next I finally got to use my new Graftobian Glitter Glams. These liquid glitter products are amazing! I simply applied some using the nifty nail polish like brush onto a palette. I then took my synthetic concealer brush and just tapped the liquid glitter over the silver powder. Absolutely no fallout! I used the Opal Confetti Glitter Glam and it looked amazing in person. Too bad glitter is hard to capture in photos. I also used my Black Velvet pencil from Graftobian to achieve my smoked out lower lashline. This creamy pencil gives me the intense black color I want. I set it with a bit of black eyeshadow for lasting powder through the night. 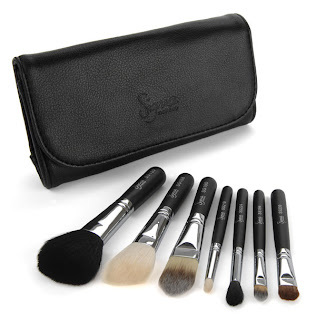 I also was able to try out my new Sigma Makeup Brushes for the first time. 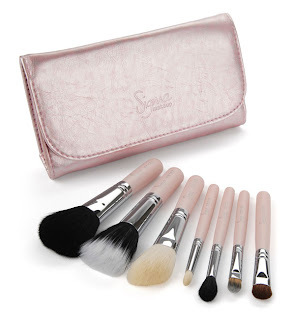 For travel brushes, these do not sacrifice on quality. I'll do a more in depth review a bit later once I've had additional time for testing. This is really the only shot where you could see the glitter, but in person it was so pretty! Click on the pics to expand. 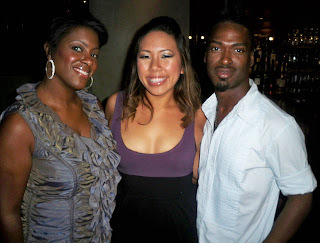 Here's a shot of me with some lovely folks from Lash Out Magazine. You can see a little bit of my dress here. It was only $12.99! The bottom part is black with a black elastic band at the waist (80's style) and has a tulip shaped skirt. I'm also wearing my new Guess Leopard Print Slingbacks at a steal from Ross for only $34.99. i LOVE this look! 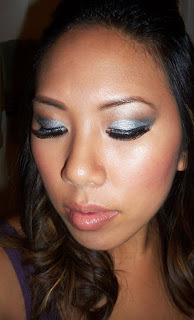 metallic silvers always look flattering and the glitter just tops it off. Nice bargain on that dress and shoes! I myself am very proud when I find a good steal like that. LOL. My fiance's last name is Hunt, and I always joke and say that I'm going to change my middle namke to "Bargain" so that my name becomes Camilla Bargain Hunt! LOL! I'm such a dweeb! i love your look, hun. very pretty. and your skin looks so flawless! the dress was so cute on you, too! looks like you and mike had fun! Lucky! How awesome! Love the makeup & dresss! That dress is quiet a steal, love it! The glitter really brings out the look. I really like it. Looks like you hada blast! This look is fire. OW! Totally heart this. How do you like the Graftobian Oxyderm Moisturizer? i have been wanting to try those brushes!!! you look beautiful. Silver looks hot on you! Especially with the contacts! I'm loving the makeup on the magazine cover. Hopefully your work will appear in that magazine soon.